The landing page is more than often the first experience a user has with the LMS. It is important that the page is not only easy and intuitive for the user, but also sparks in them a desire to go out and engage in the learning that is available to them. It needs to be targeted to users with content and information that is specific to them and their place within the company. Too much information that is not pertinent to them will cause too much clutter on their landing page that could distract from their learning objectives. 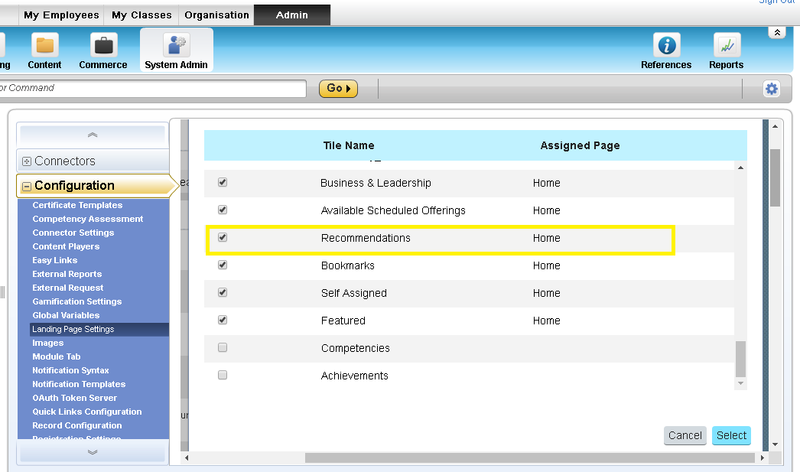 Luckily, SuccessFactors makes it easy to design landing pages that can be targeted to specific groups within a company. The user’s experience with the LMS consists of standard pages available to them, as well as custom pages that can be created. Within the pages are both standard and custom tiles that control what actions, information, and content are available to users. The first page that users will come to is their “home” page. This page contains tiles that are specific to the user’s personal learning needs. This page will typically contain tiles that display the learner’s to-do list, learning history, curricula progress, ect. These are all contained in the standard tiles that are available from SuccessFactors. As a side note, there are additional standard pages that a learner has access to depending on if they meet certain requirements. 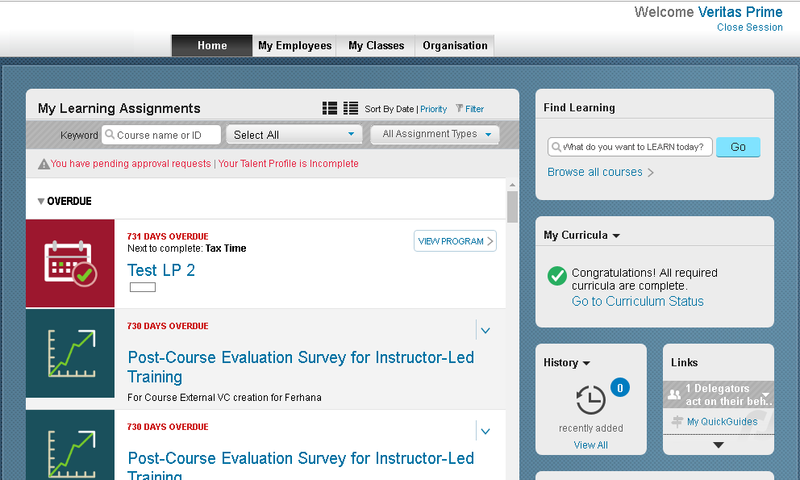 For example, the user below has access to the My Employees and My Classes page. The user was given access to the My Employees page simply from having direct reports in the LMS. The user has access to the My Classes page because they have an instructor account in the system attached to their username. There is not as much ability to control tiles here as it is on the home or custom pages – it is controlled primarily here through the user’s role. The tiles that display on a learner’s page are controlled from two different places on the admin portal – the landing page settings and on the user’s role. Both switches need to be turned “on” in order for the tile to display for the user. Let’s look at an example – let’s say that you want to grant users access to the Recommendations tile. To do that, you need to add that permission to the user role and add the tile to the landing page. 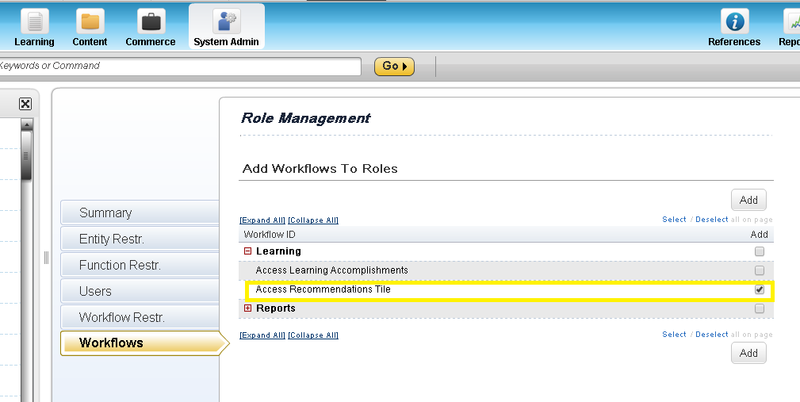 Log into the LMS admin portal and go to System Admin>Security>Role Management. Search for and select the edit button on the user role you wish to grant access to. Go to the workflows menu. Click “add one or more from list”. Check the “add” box for Access Recommendations Tile and click “add”. Note that for standard tiles, if you want this available for one group of users but not another, you need to control it on the role level. Log into the LMS admin portal and navigate to System Admin>Configuration>Landing Page Settings. Click the checkbox next to Recommendations and click Select. The tile is now visible on the user’s home page. Admins have the ability to create their own custom tiles for users. 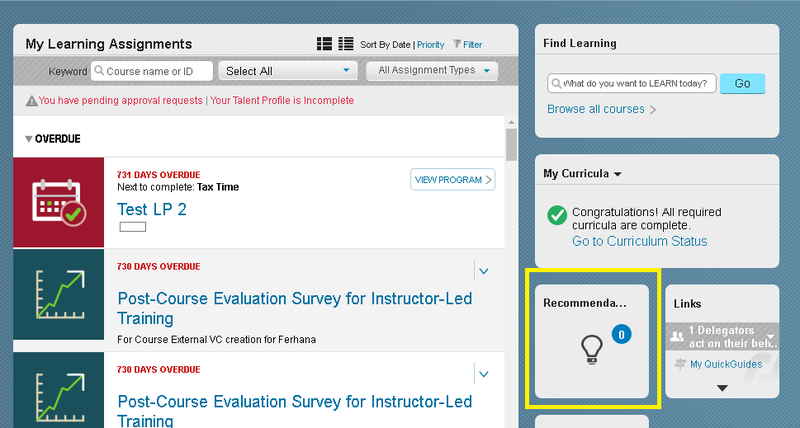 While a custom tile won’t contain specific LMS actions (you can’t add a browse course search box, for example), there are a lot of options to add content. 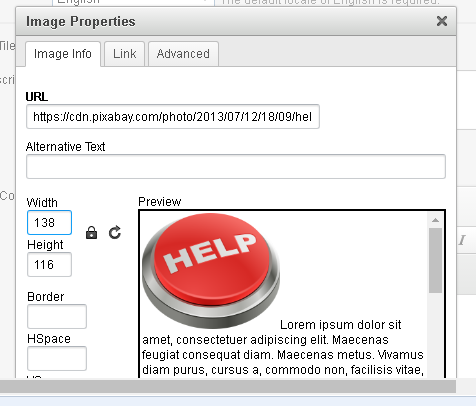 Custom tiles can contain text, html, urls, images, and Flash content. 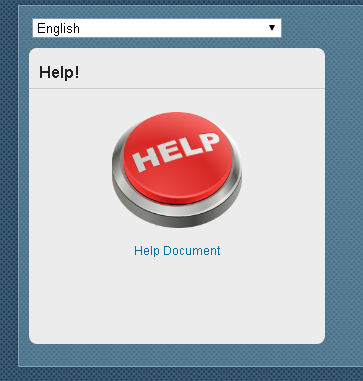 Many clients use the tiles to provide users with information on how best to use the LMS, either through a playable video or downloadable document. There is also additional options for custom tiles to target only specific groups of your company (using LMS organizations) and for only certain dates. 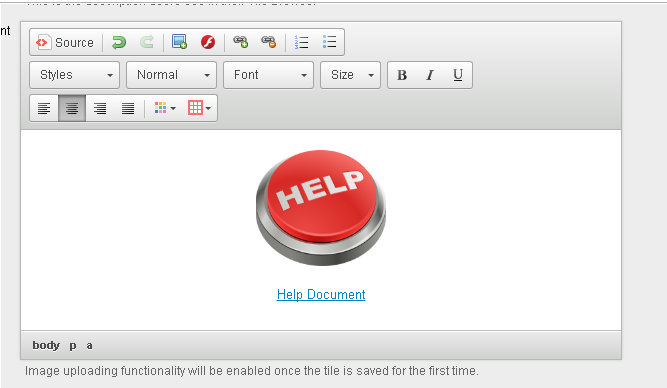 In this example we are going to create a help tile that contains a downloadable reference document for users in the sales department that will be available for three months. While you cannot house the document itself in the tile, you can store it on an accessible platform (typically SharePoint) that the users have access to and link to the document. Add a tile name (this is admin facing title, not user). If it is organization specific, search for and select the organization and indicate if it includes sub-organizations. If it is date specific, indicate the dates that the tile should display. Chose or customize the size of the tile. Select the locale you’re adding the content for (if you use multiple locales, you can customize the same tile in different languages). Create a user-facing title and description. In our case, we’re adding an image and a url. To add the image, click the image icon and add the url that houses the image and customize the image size. Click “ok”. 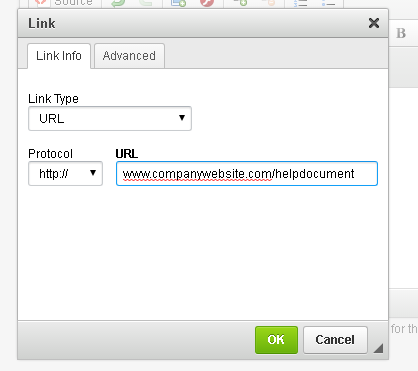 To add the url, start by typing the text you want your hyperlink to display – in our case we will use “Help Document”. Highlight the text and click the url icon. Add the url of the document and click “ok”. Format the tile as your wish (center the text, add spacing, ect). And this in the preview…ready to be launched to your users! 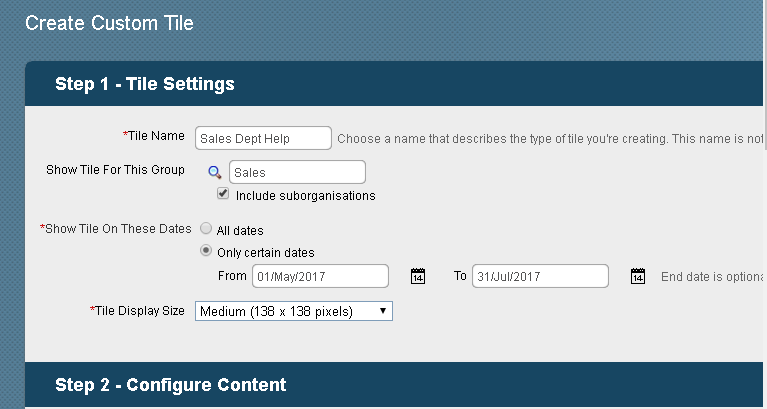 Loukas – Would be good to update your blog here with the updates coming in the next month in the Q2 2017 release where Groups can be used for custom tiles in the LMS. Groups will relieve the issue some customers face where they don’t maintain an Org structure between Organisation objects in the LMS, which in effect prevents them from really using custom tiles/pages currently for large groups as no relationships between organisations means you cannot assign a tile to one org and inherit it to all suborganisations. Groups will be available to assign to custom tiles in the b1705 release, and with Groups you use Assignment Profiles to determine the users who belong to a group, which is much more flexible and dynamic.